Professional members enjoy many benefits including networking opportunities, our bimonthly newsletter (Contemporary Rehab), discounts on training and events and up-to-date information on news relating to the rehabilitation profession. Perfect for retirees, pre-professionals and friends and family, Affiliate Members receive the same discounts as Professional Members on training and events and special networking opportunities. 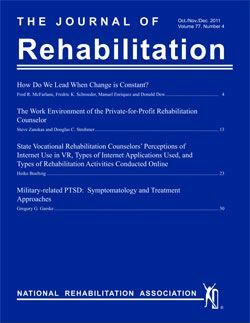 **Affiliate Members do not receive a printed version of the Journal of Rehabilitation. The New Professional membership category is a discounted professional membership for individuals who have recently graduated from an accredited college or university. The New Professional membership is only available for the first year following graduation. allows organizations or agencies to enroll up to five employees as NRA members. Employees enrolled under an Organizational Membership enjoy the full privileges of NRA Professional Membership. Student Membership is available to individuals who are enrolled as Full-Time undergraduate students (a minimum of eight (8) hours per semester) or as Full-Time graduate students (a minimum of six (6) hours per semester). The National Rehabilitation Association of Job Placement & Development (NRAJPD), a division of the National Rehabilitation Association (NRA), has Development Grant funding available again this year! Two additional Development Grants are available this year for $150 each! These grants will be awarded to state chapter divisions of JPD to provide assistance with the development of establishing a JPD division within a state chapter of NRA, membership recruitment, membership retention, training, etc. In the past, these grants have supported training or networking activities, but they are purposely left open for the state chapter JPD divisions to decide what best fits their individual needs. The development grant application is enclosed, and the extended deadline for applications on projects to be completed this year will be April 22, 2019. In order to be considered and receive a NRAJPD Development Grant for your state chapter JPD division, an application must be fully completed and submitted by the deadline. Incomplete applications will not be given consideration, so please be thorough. Members of the NRAJPD Board will review each one received and notify applicants about their grant approval by April 26, 2019. In order to receive your Development Grant payment from NRAJPD, the final report must be fully completed and sent to NRAJPD Treasurer, Christa Martin, no later than December 15, 2019. You will receive this form upon your 2019 NRAJPD Development Grant approval notification. Please contact Christa Martin at Christa.Martin@ky.gov if you have any questions or would like to submit a 2019 NRAJPD Development Grant application by the extended deadline of April 22, 2019. Join us as we celebrate our 60th anniversary of the Georgia Rehabilitation Association Annual Training Conference. It will be held on Aug. 6-9, 2019 at the Savannah Marriott Riverfront in Savannah, GA. For more information, please visit http://www.georgiarehab.org/2019-gra-annual-training-conference.html. Thanks we look forward to seeing y’all here!